A short clip of Paulo’s Muay Thai Fighter’s class which runs every Wednesday Night. We try to make sure you learn from sparring. It’s not a fight (if you want to have a fight, then just have a fight) but sparring should be a time to learn how to apply your techniques. To learn how to read your opponent, to time your shots and fight with your brain, not just brawn. Personally, I think everyone should spar. Regardless of ability. We don’t make people spar but even if you “play spar” super-light you’re going to learn. You’re going to become technically better and you’re going to be able to use your techniques for real.When you learn new techniques, when you shadow box, hit the bags or pads then you hit them the same way you hope to spar and one day fight (if that’s your goal). You train how you fight, so you fight how you train. It makes Muay Thai a “live” martial art because you’re not up against a compliant partner, they’re resisting and that’s what keeps the art and the sport real. 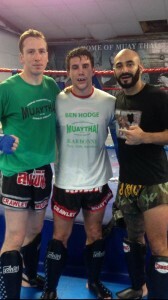 If you’re interested in learning Muay Thai you can find out more by clicking HERE. 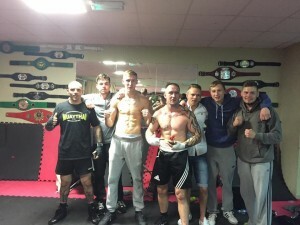 It’s been a busy week for the boxers at the gym with a few of the guys jumping in and trying the Ultra White Collar Boxing tournament – raising money for charity – and then another 7 of of the team fighting in Erith last Saturday. 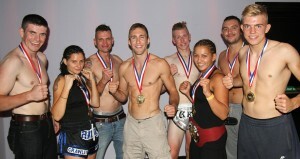 Fighting on the card were Cai, Aaron, Jake, Ashley, Josh, Dean and Randall. The results – a mixed bag for the gym. Ashley, Josh and Jake all had tough fights – that’s a good thing – and despite putting in good performances they lost to better boxers on the day. They’ve all gone away, having learned a lot and have already been back in the gym working on getting better for next time. MMA fighter, Aaron, was back in the boxing ring for the first time in a couple of years – taking a few MMA fights in between. The come-forward fighter did exactly that winning by TKO in the 2 round having already given his opponent a count earlier in the round. Randall was back in great form – the tall, rangey fighter picked his shots well, moved stylishly and did what he had to do to take home another convincing win . While Dean – in a tough, well matched fight – listened well and put his gym work to good practise to win what was only his 3rd fight. Military man Cai had boxed only 6 days earlier on the Ultra White Collar Boxing event for charity and was stepping into the ring for his first official fight for the Crawley Martial Arts Academy. Moving well and picking his shots he put on a great display to out box and win his fight. It’s been a busy few weeks down the gym and with more fights on the horizon – plus an international Muay Thai even coming up on the 21st November – it’s only going to get busier! 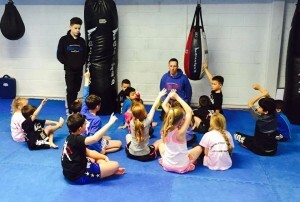 To find out more about boxing or learning Muay Thai at the Crawley Martial Arts Academy – you can get in touch by filling on the form on the side of this page or calling us on 01293 552 511. Crawley Thaiboxer – Ben Hodge – prepares for the biggest fight of his career on 25th October 2014 in Thailand. Fighting as part of an 8-man tournament Ben will face Antoine Pinto (France), Saiyok (Thailand), Alka Matewa (Belgium), Sen Bunthen (Cambodia), Michael Corley (USA), Hiroki Nakashima (Japan) and Millad Farzad (Austrailia) the 26 year old plumber from Crawley has been training daily at the Lumpini Thaiboxing club in Manor Royal. Late last year Ben travelled to France where he beat the WMF World Champion Yohan Lidon with a cut at super-middle weight (a weight division above his normal fighting weight). With only two weeks until the Kings of Muay Thai show — Ben has been training six days a week and up to twice a day (in addition to working a full-time job) in preparation. The 8-man tournament is carried out over three stages with the winners going through to the semi-final and the winners of that meeting in the final. Then in December Ben fights Priya Sumalee from Thailand in Southampton. To find out more about training in Crawley you can call the gym on 01293 552 511. 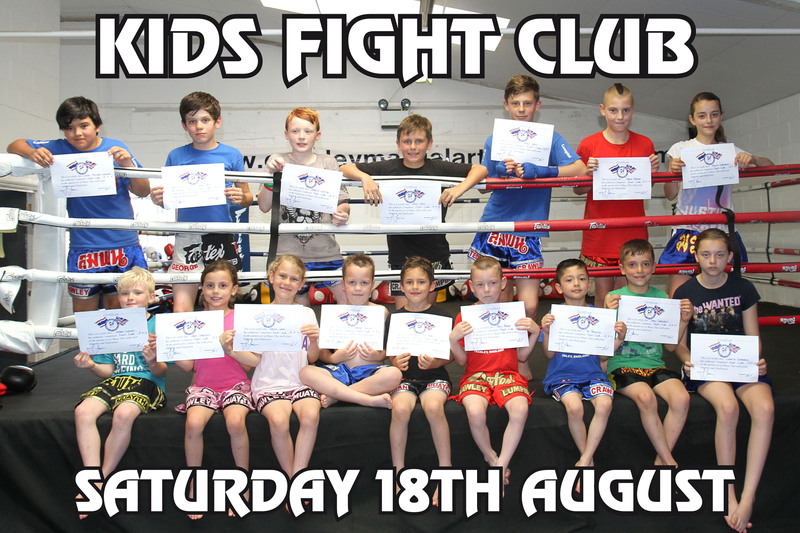 Our kids fight club is a chance for our youngest members to show case their martial art skills and put them to the test in a friendly in-house sparring session. Sparring – loved by our kids – is one of the most enjoyable parts of a lesson and in the kids fight club they spar safely and without head contact and get to show case their skills. With a fully fledged adults and kids competition team – our fight clubs are the first step our members make before stepping into the competitive arena for the first time. They are an excellent stepping stone for anyone who’d like to compete and good fun for those who don’t. The next fight club is this Sunday the 23rd March and for our members only. You can read more about our kids classes here (we have classes 6 days per week) call the gym on 01293 552 511. 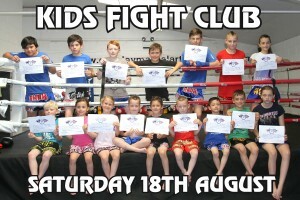 Last August Kids Fight Club, the perfect opportunity for our youngest members to show case their skill! During a fight club each child has their own corner man and there is a referee in place to keep the action flowing. The kids spar for 3 rounds back to back (as they would in competition) and have to demonstrate proper technique and the ability to listen to their corner man. It’s all about perfect practise and preparation for the next generation of Lumpini Superstars! We’re Crawley’s first and only Brazilian Jiu Jitsu club and this week ran our first kids grading this week with 10 of our next generation of martial artists passing the test. 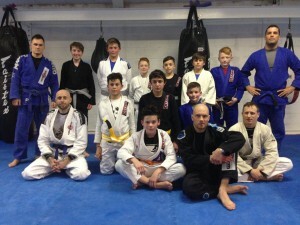 Our Kids Brazilian Jiu Jitsu classes are led by Black Belt and two time European Champion, Keith McKenzie. 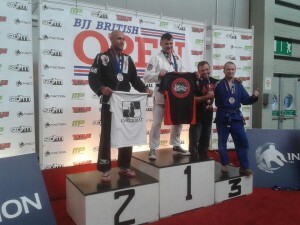 Nicknamed “the gentle art” – Brazilian Jiu Jitsu has a focus on skill and technique over brute force and strength. With an emphasis on grappling and ground fighting BJJ teaches students how to throw, control and submit your opponent without punching or kicking. A new martial art, BJJ was founded in the early 2oth century and has grown exponentially largely thanks to the Ultimate Fighting Championship and its practical nature. Like many martial arts it places an emphasis on discipline and respect while the sports element allows BJJ players to put their skill and physical fitness to the test in competition. The grading is a first for Crawley and kids and teens were required to demonstrate techniques and their practical application during an hour of sparring with other classmates and adult assistants. Using an internationally recognised grading system BJJ sets its standards high and only has give adult belts with the coveted Black Belt taking up to 10 years to earn and in May the team will travel to Birmingham to compete in the British Open. 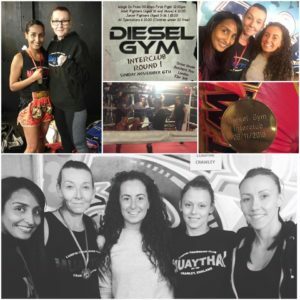 Lumpini Fight Team’s — Jane Iske was crowned the new Southern Area Champion after winning her 5 round title battle in Southampton at the weekend. The mixed fight night featured 8 fighters from the Crawley Martial Arts Academy with six Muay Thai fighters, two Grapplers and a White Collar Boxer competing. Jane, 22, from West Green was fighting Lauren Huxley from Swansea for the 62.5kg title. Both technical fighters, Jane looked strong throughout as she mixed up her punches, kicks and clinched well to fire off knees to the body of the Huxley. The young Welsh fighter was clearly looking to land head kicks but Iske’s tight guard and movement meant she was always ready to counter-attack and land her own shots. Jane grew in strength round by round and started to take control with good movement around the ring. Going to the judges score card Jane was unanimously crowned the new Southern Area Title winner. White Collar Boxer Paul Clark was matched against Mathew Daniel at 80kg. The 21 year old on his third outing for the club has been improving week on week and picked his shots well throughout the contest. Mixing it up with uppercuts and body punches, Paul fought well and listened to his corner winning with another unanimous decision from the judges. 18 year old Oscar Cutter was back in the ring for the first time since April’s Muay Thai Mayhem and beat Swansea’s, Andrew Hill. The classy teenager from Horley put on a well rounded performance as he scored well landing heavy kicks and knees to the body of his opponent. Local girl Falen Burt beat Danielle Whitfield from the Warriors Gym in Kent. The three round fight went the distance with Falen wining the well matched contest on points while Matt White fought George Smith from the same gym, losing on points. Pound Hill’s George Beach fought Bournemouth’s Tommy Barlow for the 72kg Southern Area title. The 18 year who studies at Crawley Collage had been training hard in preparation for the title bout and fought well against the strong Barlow losing on points after five rounds. Sam Hewitt, a purple belt in Brazilian Jiu Jitsu from Northgate and wrestler Ali Carter who grapple at the Crawley Martial Arts Academy were both fighting 2 x 4 minute contests. Matched against a black belt from London, Sam lost on a referee’s decision in what was a very close fight while Ali squared up to Nik Jones from Southampton losing on another close decision. All the fighters will be back in action for the Ringmasters Tournament in Kent this month competing under Thaiboxing and MMA rules and on the gym’s own “WBC Muay Thai Mayhem” event at the Effingham Park Hotel on the 2nd November. If you’d like to find out more about training at the Crawley Martial Arts Academy or fighting for their Lumpini Fight Team then call the gym on 01293 552 511.